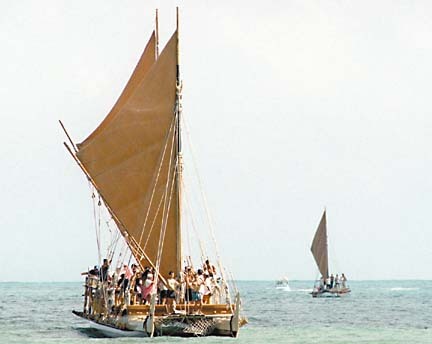 "The Hawaiians: Reflecting Spirit" includes a segment on the ancient voyaging tradition rekindled by the Hokule'a. The story of the Hawaiian people is often told as a series of inevitable events that assay out as either unmitigated tragedy or beneficial all-American progress. Filmmaker Edgy Lee offers a different viewpoint with "The Hawaiians: Reflecting Spirit." Lee is taking a rough cut of the 54-minute documentary to Washington, D.C., where it will be screened Friday as part of the grand opening of the Smithsonian Institution's $200 million National Museum of the American Indian. She anticipates local showings will begin in early 2005. In her film, Lee combines conventional scenic shots of the islands' natural beauty with fresh insights into the enduring relevance of traditional Hawaiian culture and the similarities between the experiences of native Hawaiians and the indigenous peoples of North America. In doing so she looks beyond the long-standing definition of native Hawaiians as hapless victims and instead points to a revival of pride and cultural self-confidence. Hawaiian history is covered with a broad brush. The "discovery" of Hawaii by Capt. James Cook in 1778 is followed by abandonment of the centuries-old religious system, arrival of the missionaries, the overthrow of the Hawaiian government in 1893, annexation by the United States, five decades of rule by a Caucasian oligarchy, a second "revolution" that installed one-party rule by the Democratic party and statehood. Lee keeps political and sociological commentary to a minimum but makes it clear that native Hawaiians became ever more marginalized as years passed. Filmmaker Edgy Lee's "The Hawaiians: Reflecting Spirit" was made in just four months to meet Friday's opening of the National Museum of the American Indian. The emphasis is on traditional cultural values and their value to Hawaiians and non-Hawaiians alike. Lee describes the symbiotic relationship that existed between native Hawaiians and their environment as of 1778, and the Hawaiians' view of their place in the larger scheme of things. She also explains the difference between the traditional Hawaiian concepts of land use and those of the Western and Asian cultures that have supplanted them. Other aspects of history and culture are addressed by contemporary scholars and cultural practitioners. Puakea Nogelmeier notes that Hawaiians were illiterate when the first missionaries arrived in 1819 but embraced the haole (non-Hawaiian) concept of writing with such enthusiasm that by the 1860s the kingdom of Hawaii had the highest literacy rate of any nation. More than 100 Hawaiian-language newspapers documented events big and small during the final decades of freedom. U.S. Sen. Daniel Akaka speaks matter-of-factly of growing up at a time when many Hawaiians thought they were doing their children a favor by refusing to teach them their ancestral language. He also speaks movingly of his joy in seeing his children taking pride in the culture and the language. Other speakers include Alaka'i Kahuena, who describes the traditions and protocols involved in harvesting and using medicinal plants, and Nainoa Thompson, the first Hawaiian celestial navigator of modern times, who explains why long-distance canoe voyaging is about much more than re-enacting a heroic ancient past. The most powerful segments address the struggle faced by native Hawaiians who attempt to maintain their culture. A woman whose family has been salt makers for generations tears up while talking about people who steal the salt or make it without observing the traditional protocols. Two former residents of Niihau speak with obvious emotion of the sense of loss they feel at being forced by economic circumstances to live away from their ancestral aina. And, tying native Hawaiians into the struggles of indigenous people across North America, Lee also includes the observations of a specialist in that area. Considering that the film was completed in four months to make the opening at the Smithsonian, there are remarkably few problem areas. It isn't clear from the narration whether Kamehameha unified the islands before or after Cook arrived in 1778, and a viewer unfamiliar with Hawaiian history could easily assume that Grover Cleveland was still in office when the United States finally annexed the islands in 1898. A few revisions of the audio track would clarify the facts and smooth out the only obvious rough spots in this impressive film.